Say goodbye to boring running apparel with the collection of men's short sleeve running tees from Gone For a Run. Not only are these fun runner's T-shirts made from high-quality, comfortable material. They're also made with running-inspired sayings and designs that are sure to be a favorite of any runner. From zodiac signs to race cities, there is a men's running shirt for every personality in our selection. 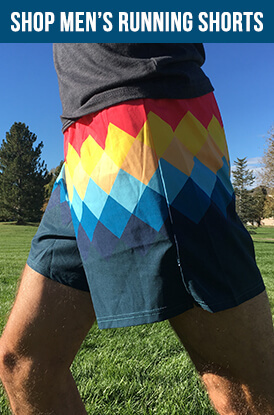 Each one is made from soft, combed cotton and polyester blend fabric that comes in a wide array of different colors. Our run T-shirts come in both standard and vintage fits. These versatile shirts are perfect for your daily runs, an upcoming race or for everyday casual wear. Celebrate the holidays in style without missing your daily run with our holiday-themed running tees for men. Our festive holiday shirts include Christmas and Thanksgiving options for the winter holiday season. There are also Easter running shirts, Halloween T-shirts for runners and St. Patrick's Day shirts. Show your appreciation for your dad or another father in your life with one of our Father's Day running shirts. You can also show your American pride with our line of patriotic T-shirts for runners. If you'd rather choose a shirt that you can wear year-round, try one of our run mantra T-shirts or a shirt based on your profession. Anyone who runs with their dog will appreciate our dog-inspired runner's T-shirts. Or, you can have a little fun with our drinks and treats running T-shirt collection. Some of these shirts feature jokes about needing a beer or pizza after running your daily miles. Our men's race distance tees are a great option for anyone who has just completed a milestone race. They feature a range of different distances and race types from 13.1 half marathons, 26.2 full marathons to ultra races and triathlons. We even carry cross country and track and field T-shirts to commemorate other types of races. Some of our other men's short-sleeved T-shirts for running include location-based designs. Our race city shirts feature large race locations, such as Boston, Chicago and New York City. 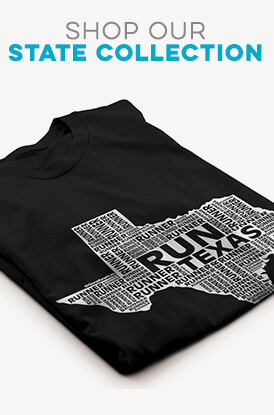 We also carry state running shirts that combine U.S. states with running-themed text.